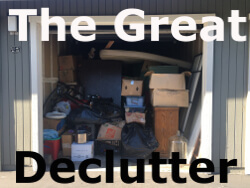 This is Part 4 of The Great Declutter series on how streamlining my backpack survival gear led me to downsizing the rest of my possessions by 2/3. Despite all of the hard work of sorting and making Goodwill runs, I found some things that made me squeal with delight. Some of my stuff makes me so happy!! And that is the point of decluttering. I want to be surrounded by things that don’t make me feel guilty, obligated, angry or any other negative emotion. I want to feel light and happy in my home. It’s interesting how objects change meaning over time. 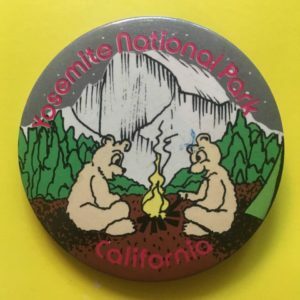 When I was about five years old, my outdoorsy Aunt and Uncle gave me this pin and it would remind me of our camping trips together. Since then I’ve lived and worked in Yosemite, so a lot more memories and associations come up when I think about the Park. This pin is still one of my prize possessions. 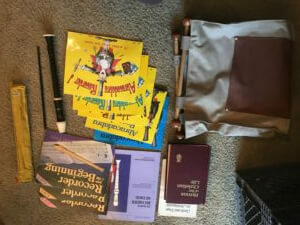 I use to love practicing my recorder and reading through the magician themed lesson books! But that was over twenty years ago, so why do I still have this? I thought about it, I don’t want to pick up the recorder again, so I thanked it for all of the wonderful memories and sent it off to Goodwill. This is the worst present that I’ve ever given. I didn’t know what to put on my grandparent’s paperweight, so I painted the wreath that was hanging in our hall, complete with wallpaper texture. 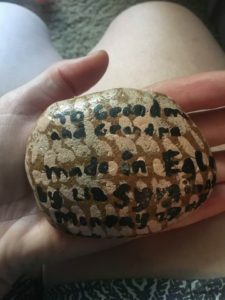 To make it worse at the time we were living in England, so this rock was mailed across the ocean to California. I knew even then that it was a lame present. 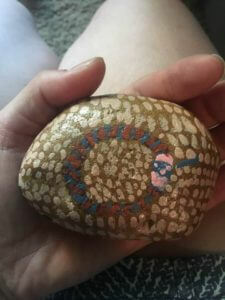 It’s so bad that I had to take it back after my grandpa passed away. 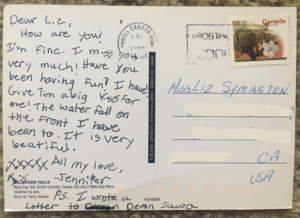 I found this super cute postcard from one of my cousins. We were both in middle school and one of us had a mad crush on Devon Sawa. Do you remember the animated version of Casper? Sigh. Heart throb. I wonder if he ever wrote back? Our family dog, Chip, passed away many years ago. Rediscovering this photo was very touching to me. 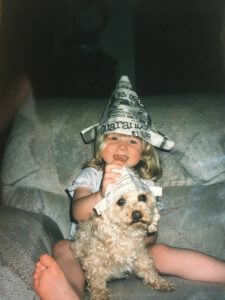 Kadie, my cousin, says she remembers wearing the paper hat! Chip looks so miserable and yet it makes me smile. 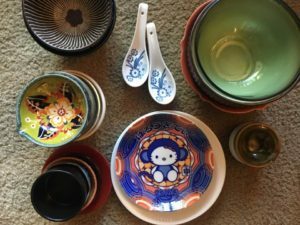 I adore my dishes! They have been in storage for two years. Looking through them brought back so many fond memories of hosting the regular friday night family meals at my old apartment in Emeryville. I love my Bay Area friends! I look forward to hosting future make-your-own-sushi parties! 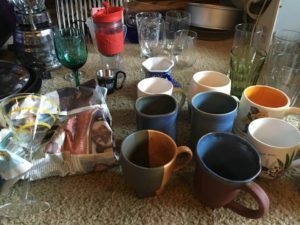 Going through the emotional ups and downs that comes from decluttering is very rewarding. I feel so much lighter having decided one and for all what to do with everything, only keeping the stuff that makes me happy. And now onto the Tying Up Loose Ends!